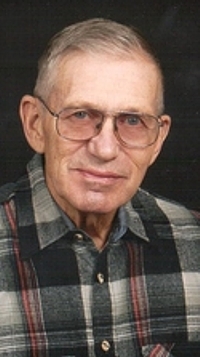 Richard H. Ahrendsen, 81, of Olin passed away on Thursday, October 8, 2015 at Jones Regional Center in Anamosa. His funeral service was held at 10:30 AM on Monday, October 12, 2015 at Lahey Funeral Home in Olin. A visitation was held on Sunday, October 11, 2015 from 2:00 – 5:00 p.m. at Lahey Funeral Home in Olin. Burial was held at Oakland Cemetery in Solon. Richard Ahrendsen was born on May 6, 1934 to Henry and Leola (Paulsen) Ahrendsen near Hale, Iowa. He graduated from Olin High School in 1952. On December 6, 1961 he was united in marriage to Trula See at the Shueyville United Methodist Church. He worked as a machinist at Iowa Manufacturing for forty-two years and farmed on the side. Richard served for the United States Army. He was a member of the United Methodist Church in Olin. He was also a member of the Olin American Legion, the Polka Club of Iowa, and Gideons. He enjoyed cutting wood and painted many barns, houses and a church over the years. He enjoyed trapping, as well as many other outdoor activities. He also enjoyed dancing and going to Polka Fests. Those left to cherish his memories are his wife Trula Ahrendsen; two children; Hanna Grant of Olin, and Ronna (Jim) Beitz of Hopkinton; and a brother Harold Ahrendsen of Hale, and two granddaughters, Rachel Beitz, and Jenna Heitz. He is preceded in death by this parents, Henry and Leola Ahrendsen.